The final details were announced earlier today in Pjazza San Gorg, which will be hosting the Valletta New Year's Eve festivities. 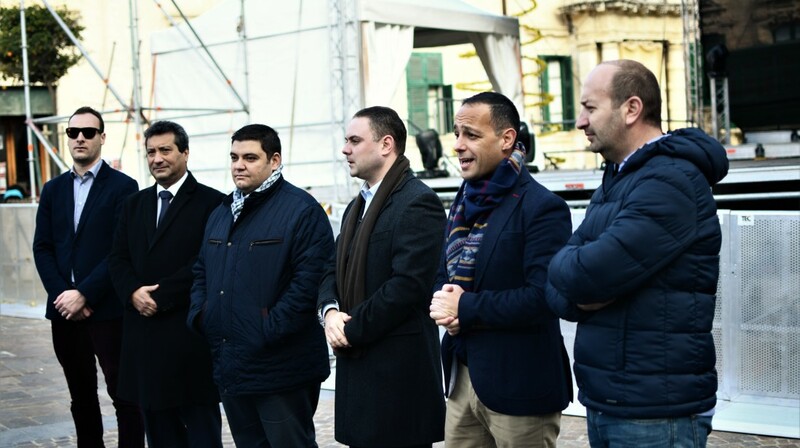 From right to left: G7 Director Owen Spiteri, Valletta 2018 Chairman Jason Micallef, Minister for Justice, Culture and Local Government Owen Bonnici, Valletta Mayor Alexiei Dingli, MTA Chairman Gavin Gulia. The highly anticipated Valletta New Year’s Eve Celebrations will kick off at 8pm this Saturday in Pjazza San Ġorġ for one of the biggest festivities on the island. The event is being organised by the Valletta 2018 Foundation in collaboration with the Ministry for Justice, Culture and Local Government, the Ministry for Tourism, the Malta Tourism Authority and the Valletta Local Council. Minister of Tourism Edward Zammit Lewis said that activities organised on a national scale such as the New Year’s Eve festivities are essential for the yearly calendar, especially for the tourist industry. Tourist are able to plan their holiday before coming to Malta during the festive seasons and have the opportunity to join the local community in festive activities. The line-up for the evening includes Ozzy Lino, Daniel Cauchi & the Big Band Brothers featuring Marit Kesa, followed by hosts DJs Pierre Cordina and Clint Bajada who will take over and play some of the best hits of 2016. The Digital Projections, a collaboration between the Valletta 2018 Foundation and MCAST, will also be projected on the Palace façade, with a special countdown to usher in the New Year, followed by a live performance by X-Factor UK 2015 finalists Reggie and Bollie, with DJ Mykill and Trumpet Live closing off the night. The New Year’s Eve festivities will run till 2am. The public is encouraged to make use of public transport with the last bus departing from Valletta at 1:50am, the last service to Floriana Park and Ride leaving at 2a.m. while ferry connections will continue to run till 4a.m.